Communication is ubiquitous in today’s societies; more and more devices participate in communication processes, as in for example the Internet of Things. With this omnipresent communication, the process of communication is sensitive itself as it already can disclose information about the content. Anonymous communication is desirable in many scenarios, e.g., the IoT, allowing to communicate without someone being able to attribute the communication to its senders and recipients. Sender anonymity is a hard goal; the only viable option to achieve it is cover traffic which blends communication into noise. In turn, this noise degrades the system’s efficiency rendering it unrealizable eventually. Moreover, cover traffic as a technique is hardly understood and analyzed. We perform a parameter study to analyze the influence of varying participation, utilization, and timing properties on anonymity and efficiency. Our results indicate that cover traffic can be generated more efficiently while anonymity is still on a reasonable level. 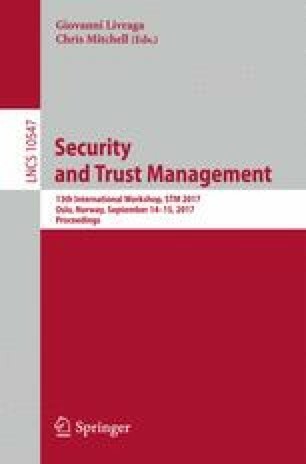 Nonetheless, randomization of cover traffic allows performing intersection attacks to diminish anonymity in the long run. This work has been co-funded by the DFG as part of projects B.2, D.4 within the RTG 2050 “Privacy and Trust for Mobile Users” and by the German Federal Ministry for Education and Research (BMBF, Software Campus project KomBi, grant no. 01IS12054).